Pete Cohen is a professional life coach and motivational speaker. He teaches, inspires and assists people to overcome personal challenges in a calm and inspiring manner. The keynote speaker Pete Cohen has the personality and skill to change people’s lives. Our speaker Pete Cohen has made himself a reputation as a motivational coach, business consultant, life strategist and bestselling author to become one of the most sought-after speakers on personal development. Pete Cohen has the talent to understand people and their limitations. In his coaching sessions, Pete Cohen finds out what stops people from leading more productive and fulfilled lives. He is driven by his wish to inspire clarity of purpose in people, knowing that by doing so they will become more positive, more productive and more receptive to change. 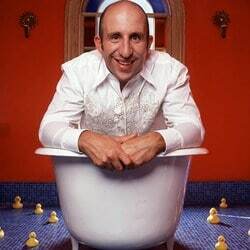 Possessing an exceptional background, the renowned speaker Pete Cohen is regarded as an authority on motivation by the world of sport, having coached world-class athletes and sporting greats, such as Sally Gunnell, Ellen MacArthur and Ronnie O’Sullivan in achieving peak performance and overcoming adversity. Pete’s impressive portfolio of business clients includes over 200 different major corporations including RBS, BAA, Coutts, O2, Vodafone, Marks & Spencers, IBM and Northern Rock. His speeches and motivational workshops can be tailored to his client’s specific needs. The sessions are rather structured conversations than classic keynote talks. Pete Cohen uses his energetic style to animate his attendees and enables them to form a greater understanding of their individual and collective goals. With his energetic nature and passion for coaching, our speaker Pete Cohen is able to deliver valuable content in a highly interactive and motivating manner. The ever-changing business climate, the relentless pace of work, the ever-increasing pressure to manage costs and still out-perform year-on-year, the importance of managing our own personal brands and reputations, the expectations others place on us to achieve the impossible and show willing. How can we cope with these pressures defines our character; our character defines how able we are to manage the interference and deliver time after time. What is this quacking in our heads all about? Everyone knows that motivation is vital to the success of any workforce. The problem with many motivational presentations is that people can get inspired by the achievements of others and even feed off the presenter’s enthusiasm. However, this motivation often wears off. The traditional concept of a leader being the directing chief at the top of a hierarchy is nowadays a very incomplete appreciation of what true leadership must be. The keynote speaker Pete Cohen will share in this presentation how leadership in the 21st century does not necessarily require great technical or intellectual capacity. Good leadership in the modern age, more importantly, requires attitudes and behaviours which characterize and relate to humanity. To bring about change, you have to go first. This is one of the most fundamental principles of business transformation and yet it is one of the most challenging. Habitually, when we seek change, we look first for others to behave differently (“Do as I say, not as I do”). This is where Pete’s skills as a top performance coach come into play. He is a master at helping people become aware of the inner voice we all have which holds us back. This allows his audiences to make different choices based on vision and passion rather than fear and doubt. The emerging statistics are stark – the vast proportion of our teams are physically, mentally and emotionally below par and it reflects in their performance. Recent research highlighted up to 900% return on investment by focussing on corporate wellness. Pete works with organisations to explore the benefits of a happy, healthy and motivated workforce and the impact this has on them, their lives and on the bottom line. The benefits of focusing on wellbeing, which include better decision-making, higher productivity and improved team relationships – as well as the obvious reductions in sickness and staff turnover. How to improve employees self-confidence, thereby tapping into their true potential. Very organised, inspiring to talk to. Presentation was very relevant and incredibly interesting and thought-provoking. We had over 650 people at our event and Pete was last on. This is normally a tough call but the energy levels and enthusiasm Pete brought into the room was infectious and it definitely left our audience with the desired feeling and attitude. It was a huge bonus to what we were trying to achieve. Thank you.